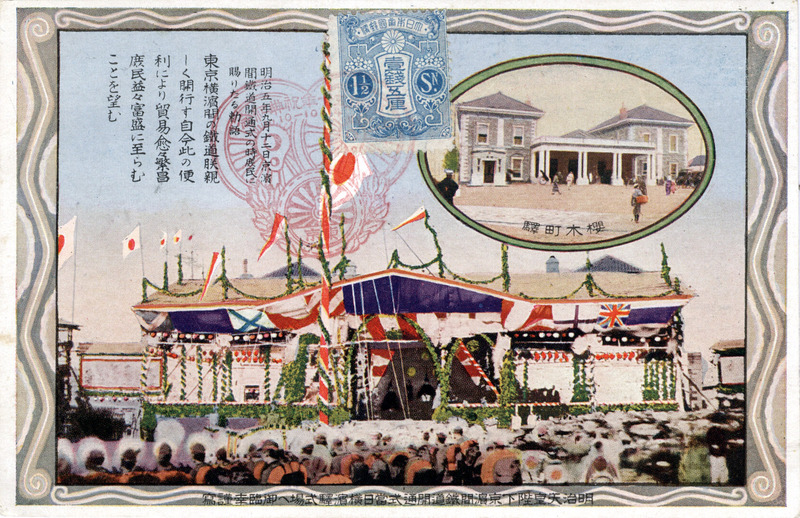 50th Anniversary commemorative postcard of the Japanese Imperial Government Railways, 1922, displaying the celebration held at Sakuragicho Station, Yokohama. 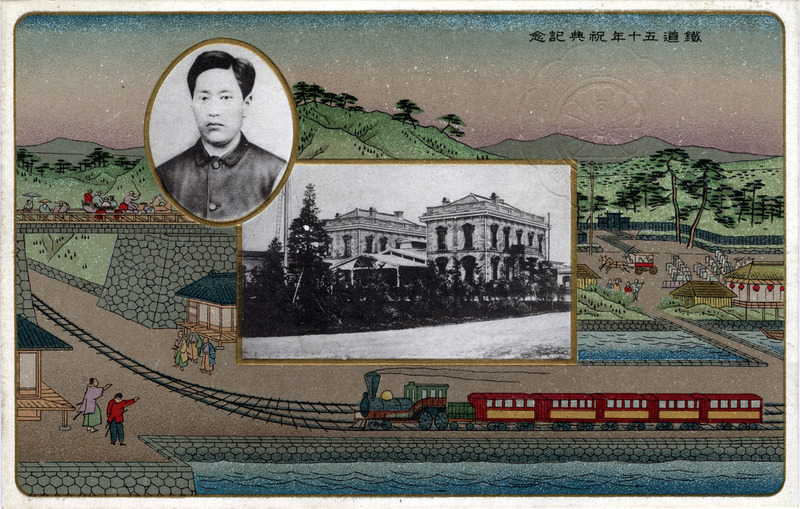 Inset image shows the original Yokohama city terminal at Sakuragicho, Japan’s first train station, opened in 1872. “On 7 December 1869, Harry Parkes [the Consul General of the United Kingdom to the Empire of Japan from 1865–83] met the heads of the Meiji government to discuss basic measures for introducing railways and telegrams in Japan. they were close to the city sections and the foreign settlements. 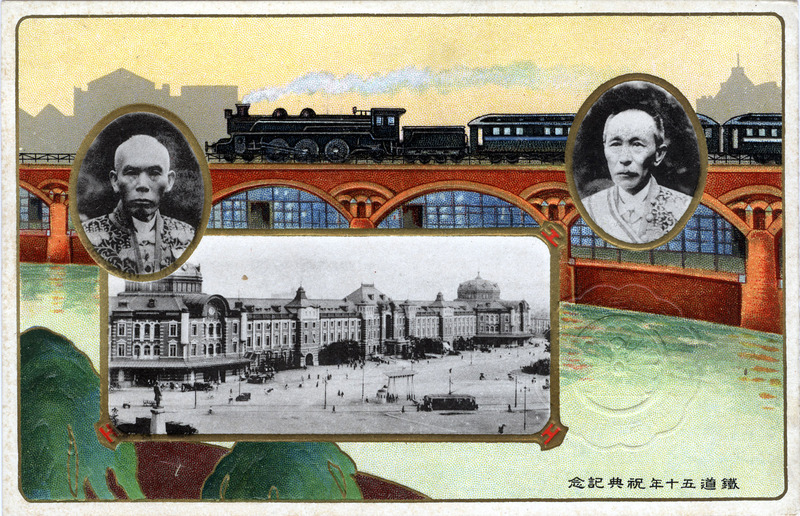 50th Anniversary of Japanese Railroads commemorative postcard, 1922, displaying an inset photo of Tokyo Central Station over a motif of elevated Tokyo railway. Pictured at left is Okuma Shigenobu, Vice Minister of Finance in 1872 (and, later, Japan’s 8th and 17th Prime Minister). Ōkuma was an early advocate of Western science and culture in Japan, and the founder of Waseda University. At right is Prince Sanjo Sanetomi, Minister of the Right at the time the first meetings were held by the Meiji government regarding railway development in Japan. “In the Empire of Japan there is now open to railway traffic 5,000 miles of line. The first rail laid in Japan was in the year 1872, when the Government built the railroad from Tokyo to Yokohama, a distance of 18-miles. The next ten years saw only 114-miles of railroad in Japan and, in 1883, the first private railway company was established. There are altogether 19 separate lines. “In the year 1906, seventeen private railways were by act of the Diet placed under Government ownership the period within which it was provided they should so be nationalized being ten years, but, as a matter of fact, the purchase was effected within one year. “There has been a steady improvement in the railroad equipment, only a few years ago, so extremely primitive, and even up to a few months ago, owing to the necessity for economy, showing little change. Now, however, the railway board under Baron Goto, who is the active Minister of Communications, is effecting changes and making additions to the accommodations for travelers. 50th Anniversary of Japanese railroads commemorative postcard, 1922. Photo inset at center is of Japan’s first railroad station at Sakuragicho, Yokohama, opened in 1872. Upper-left is pictured Inoue Masaru, who was appointed the Directory of Railways at age 29. His many years as head of the bureau earned him the reputation as ‘father of the Japanese railway system’. In 1891, after retiring from government service, Inoue founded Japan’s first locomotive manufacturer. “The Railways (tetsudo, or ‘iron road’) are owned and operated chiefly by the Railway Bureau (tetsudokyoku) of the Imperial Japanese Government and are excellent, well-managed, and remarkably safe. In point of general trustworthiness and equipment, they compare favorably with those of the most progressive countries of the world. “The extensive system is undergoing steady improvement, and the aim of the Gov’t is to gridiron the Empire with railroads which eventually will rank as high as those of America, Germany, and England. The narrow gauge (3 ft. 5 in.) precludes the doubtful luxury of high speeds but so makes for safety that bad accidents are rare. The lines are run on business methods to please and to serve the public, and the system is almost as thorough as that of Germany. 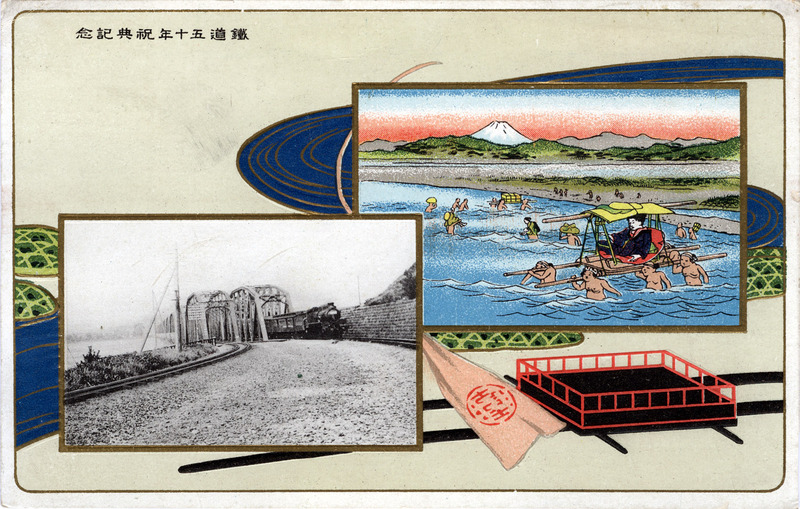 50th Anniversary of Japan Railroads commemorative postcard, 1922. Photo inset at lower-left pictures a Tokaido Main Line express crossing the Tama River south of Tokyo.